This website has now been updated for 2019, and we are taking orders for spring shipping. For 2019, more of our daylilies are listed as DISPLAY ONLY. We need to limit the number of daylilies that we sell in the spring because this is our busiest time of the year getting the garden ready. It is only the two of us; and, we have found that once shipping begins, there is little time for anything else. We also keep a grandbaby a couple days a week, so our time is very limited. We will likely make more daylilies available for fall shipping and will once again have a SUMMER SALE LIST posted by mid July. Be sure to click on the daylily picture or name to see multiple pictures for many of the daylilies. I will be adding additional pictures throughout January as time permits. We will once again participate in the American Daylily Society Voucher Program in 2019. Shady Rest Gardens is an American Hemerocallis Society Display Garden since 2009 on 3 1/3 acres north of Cartersville, Georgia (Bartow County). It is located in Northwest Georgia about 50 miles northwest of Atlanta and only about 2 miles west of Interstate 75. We grow about 1700 registered daylily cultivars and hundreds of our seedlings along with a wide variety of other perennials, annuals, shrubs, and trees for color and diversity. Our peak daylily bloom is usually mid June, but we have many blooms into early July and even later. Many of our daylilies are grown in raised beds that contain pine bark fines and composted horse manure. We fertilize with a fertilizer with a 3:1:2 ratio, Milorganite, alfalfa pellets, and epsom salt. We had a well put in 7 1/2 years ago solely for the purpose of watering our daylilies. Daylilies DO love water! We are fortunate to live in a part of the country where we can grow most evergreens, semi evergreens, and dormants. We are a licensed garden by the State of Georgia. We have a spray program for insects and rust. We do receive new daylilies each spring from rust prone areas. Invariably, we then find some rust on a few of these new daylilies. We immediately trim the foliage to just above the crown and treat the affected daylilies and those growing around the affected plants. This procedure has been successful for us along with our spray program to keep rust from spreading in the garden. We will not ship any daylilies with visible rust. We do not like to receive daylilies with rust and will never knowingly ship any with rust to a customer. Our winters are cold enough that rust does not overwinter here. If rust is an issue for you, please do not order. At this time we do not ship to California or outside the continental United States. 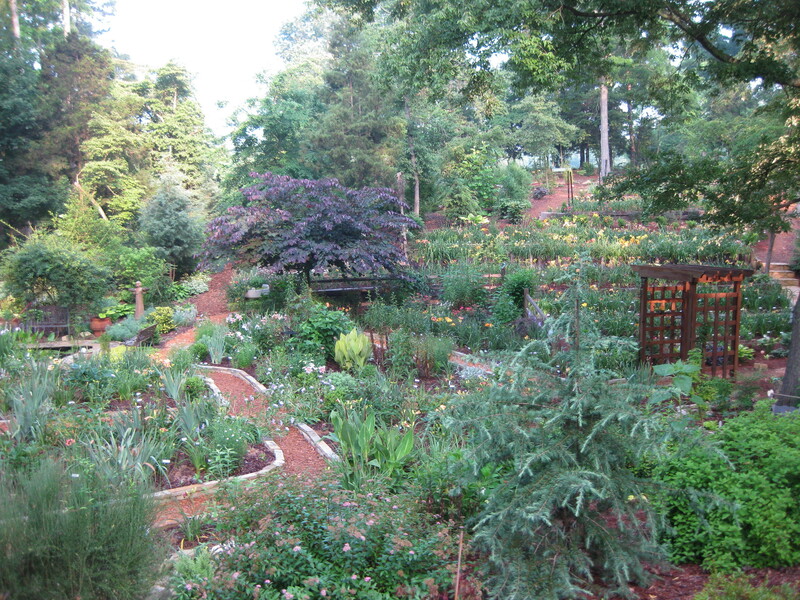 Our garden was on the 2015 National Convention tour in the Atlanta, GA area. We thank all who attended the National and our garden. So many were very complimentary of our garden. We appreciate your kind words. In preparation for the 2015 National, we moved all of our Ned Roberts' introductions to one area. We now have over 100 of his introductions which have clumped nicely and will need dividing in the near future. We relocated our Wizard Of Oz bed several years ago, and those daylilies have gone crazy. We will be adding additional Oz daylilies as well as more Oz memorabilia. Tim Herrington's MAYOR OF MUNCHKINLAND stole the show during the National! We started downsizing several years ago and are making progress. Now we mostly only add daylilies that we will use for hybridizing. We will once again post a SUMMER SALE LIST by mid July for fall shipping. Be sure to check back in July for some bargains. From time to time we are asked about the availability of DISPLAY daylilies. These may be daylilies that we have recently added and want to increase before offering for sale. They may also be daylilies that are being used for hybridizing or just ones that we really like and want to keep for now. Many of our diploid miniatures and Tim Herrington introductions are not available, as David uses these daylilies for hybridizing. We try to check our email daily and respond ASAP. During the busy spring and summer seasons, we may miss a day checking. The best time to reach us by phone is before 8:30 a.m. and after 8:30 p.m. during the spring and summer months. We spend as much time as possible working in the garden during these busy months. Spring shipping begins April 20. 2019 and will continue through mid May. Shipping will resume August 17, 2019 for northern gardens first and conclude mid October to southern areas. This site has been accessed 1355023 times.